TURTLES SHOULD NEVER BE TAKEN FROM THE WILD! Have you ever seen a cute little turtle on the roadside or in a river or lake? Lots of people have had the pleasure of seeing turtles in the wild- as they are often easy to see and not too weary of people! This time of year, turtles are beginning to hatch after months of developing inside eggs that were laid in the spring. When turtles are just hatched they are the most vulnerable to predators and even humans! Most hatchling turtles can fit inside the palm of your hand. Often time humans have the misconception that a small turtle is a helpless turtle. Turtles are wild and unless they are trapped or diseased- they do not need our help! A hatchling bog turtle. Photo by Kelly Triece. If you find a turtle, please leave it – even if the surroundings seem strange to you, it probably feels right at home. Moving turtles away from their home range can cause disorientation and leave it vulnerable to predators or other hazards. 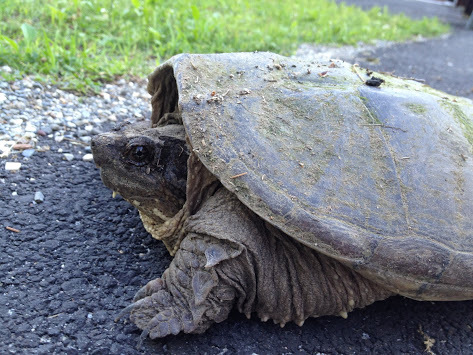 If a turtle is ON a roadway- then it can be quickly helped off the road! Please see our recent blog post about helping turtles on the road. If you do move a turtle off the road, never take the turtle to a completely new location. Finally, handle it as little as possible to reduce the risk of injury or disease for you and the turtle. It can be exciting to see a turtle in the wild, and it may be tempting to continue to handle it or even take it home to keep as a pet; however, it is important to remember that they are wild animals and will live much better lives in their natural habitat than they will in a tank. In many cases, wild caught turtles do not adjust to captivity, as they do not react well to sudden space and dietary restrictions. 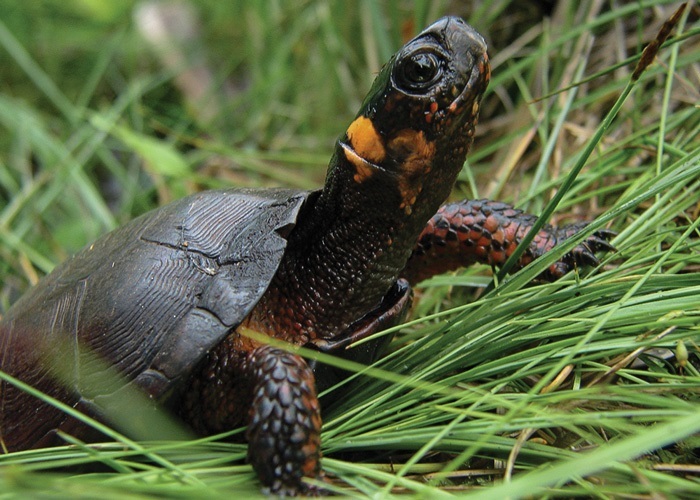 Furthermore, only a small percentage of wild turtles survive to adulthood, so removing them from the population can be detrimental to that population’s future. Thanks for helping us Keep Turtles Wild! New Jersey is home to a number of turtle species, and this time of year, it is not uncommon to see some of them crossing the road. Slow movers on land, they are not well equipped to avoid the dangers of a busy roadway. If you come across a turtle on one of your streets, what should you do? An eastern box turtle. Photo by Ben Wurst. First of all, it is important to think of your own safety in addition to the turtle’s. Be sure to pull completely over to the side of the road and to put on your hazard lights. Check for cars, and make sure that you are visible to oncoming traffic. Snapping turtle. Photo by Kelly Triece. If you want to move a turtle across the road, there are a few things to keep in mind. To start, remember to never lift a turtle by its tail or limbs, as this can cause serious injury. With most turtles, it is best to pick them up on either side of their shell between the forelimbs and hind limbs. Even small ones may squirm and kick, so try to keep a firm hold and carry them low to the ground to avoid a dangerous drop! If the turtle is large with a long tail and pointed head, it is likely a snapping turtle and should be met with some extra caution. Try using a blunt object to gently coax it to the roadside, and be careful to avoid touching it anywhere within range of its bite, which can reach as far back as the middle of its body! If you think you need to carry it, hold it with two hands on the shell behind its hind legs, on either side of the tail. 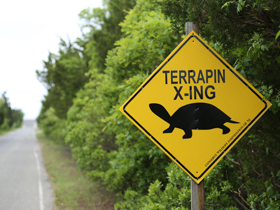 Terrapin X-ING sign along Great Bay Blvd. Photo courtesy of Ben Wurst. Before you handle a turtle, notice which direction it’s facing. Move it to that side of the street, as it is likely determined to head to a certain site, and will end up in the road again if it is moved away from its goal. This is an especially important point with the many threatened and endangered turtle species in our state. 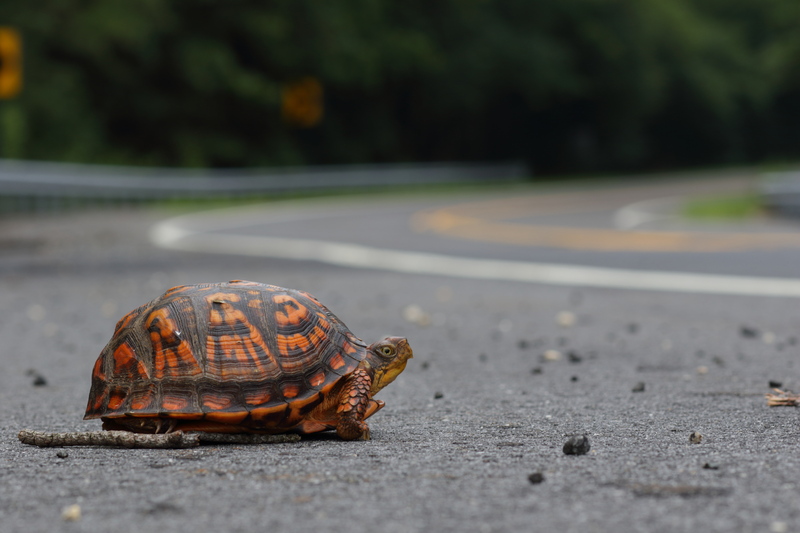 Helping turtles in trouble across a roadway and leaving them to enjoy their natural environment is a great way to ensure that there will be more wild turtles to appreciate for years to come! Last week on July 15th, Governor Chris Christie signed a bill into law effectively making it illegal to hunt or harvest diamond terrapin, a species native to New Jersey’s coastal salt marshes. Now legally considered a non-game indigenous species, the terrapin will be subject to all laws and regulations as stated in the Endangered and Nongame Species Conservation Act. For many, this news is long time coming. 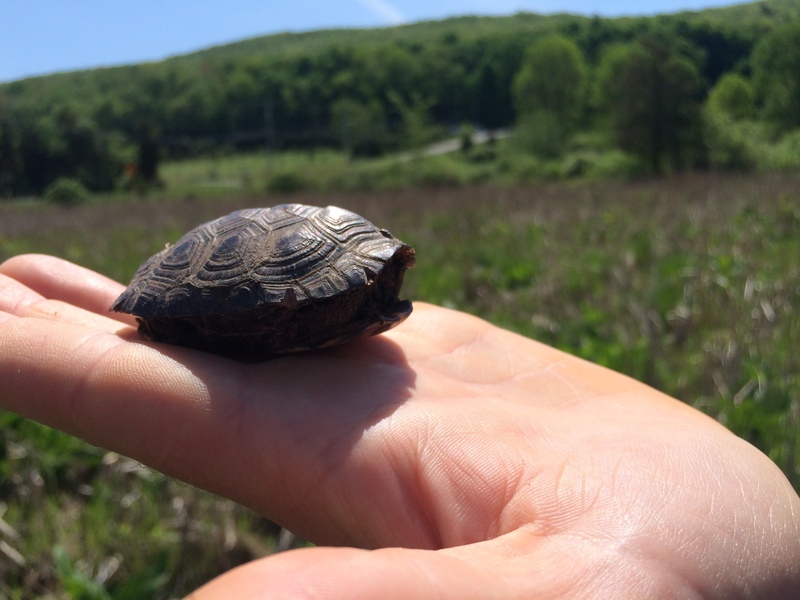 Since 2009, Conserve Wildlife Foundation of New Jersey has worked diligently alongside our partners to conserve, research and raise awareness for the plight of the diamond terrapin. 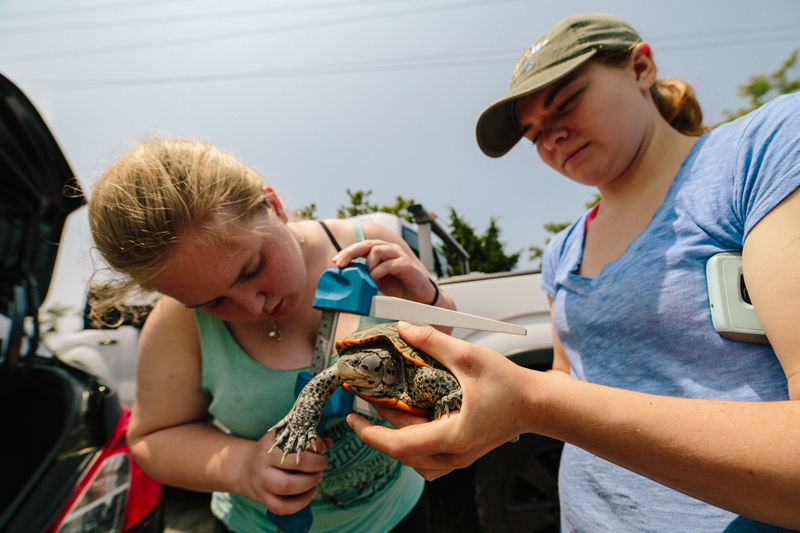 The Great Bay Terrapin Project aims to reduce the number of deaths and simultaneously educated the public on the importance of conserving this vital species. Out of all the threats the terrapin face, including habitat loss, ghost crab traps, and accidental deaths, harvesting of the terrapin has increased in a number of areas around the state as the demand for terrapin (as pets) and terrapin meat grows in overseas markets. Up until this new legislation, the diamondback terrapin could be legally harvested in New Jersey during the permitted hunting season. Unfortunately, there has never been any formal regulation in place to keep track of just how many were being taken from the wild. All that was required was that the terrapin be caught by hand. However, an incident in 2014 that resulted in the harvesting of near 3,500 terrapins only reaffirmed that something more needed to be done. For the past two years, the New Jersey Department of Environmental Protection (NJDEP) commissioner Bob Martin signed an administrative order ending the harvesting season early. The culmination of these incidents, along with years of monitoring and studying the terrapin and the ongoing threats they face supported the concerns brought forward in the legislation to Governor Chris Christie. We have never been able to fully grasp the status of the terrapin population here in New Jersey, but this legislation opens up new opportunities and renewed hope, to those of us not only at CWF but our partners around the state. We hope that this new law will deter those who wish to harvest the terrapin illegally, and that those who do and are caught will be prosecuted. In the meantime, there are still many ways you can help in protecting this beautiful and unique species.